"What was it about this job that makes it more important than your life?" Open Road Films has debuted a new full-length trailer for Oliver Stone's political thriller Snowden, profiling the life of NSA whistleblower Edward Snowden, played by Joseph Gordon-Levitt. The trailer was also shown during the Comic-Con presentation in Hall H this week, where Oliver Stone also commented on Pokemon Go. Shailene Woodley co-stars as his girlfriend Lindsay, also featuring Nicolas Cage, Zachary Quinto, Timothy Olyphant, Melissa Leo as Citizenfour director Laura Poitras. I prefer the first trailer for this film, because this one really plays up the intensity and thrilling aspects of this film more than the story itself. I'm also not fond of the music they use in this, but I still really want to see it, just to check it out. Maybe it's actually a good film. You can still watch the first official trailer for Snowden here, to compare the footage from these two. Snowden is directed by Oliver Stone who co-wrote the script with Kieran Fitzgerald (The Homesman), based on both Luke Harding’s The Snowden Files: The Inside Story of the World’s Most Wanted Man and Time of the Octopus, the novel from Snowden’s Russian lawyer Anatoly Kucherena. 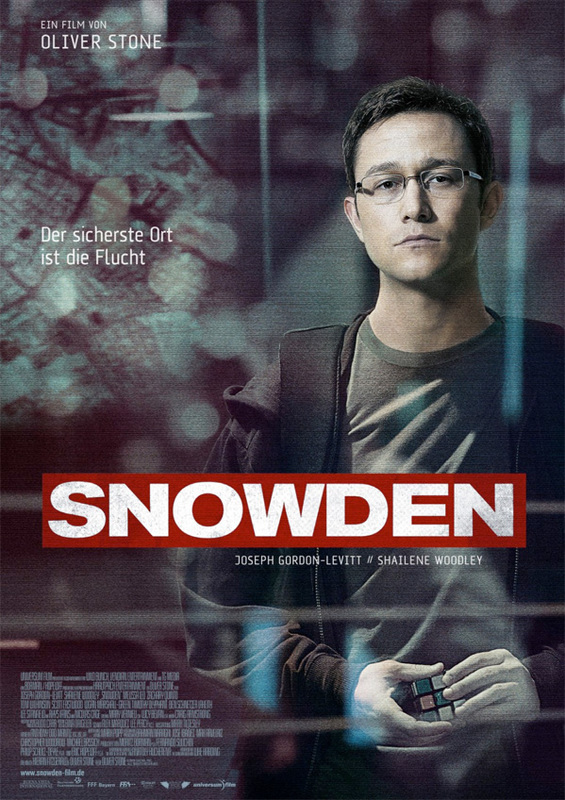 The story follows NSA whistleblower Snowden (Joseph Gordon-Levitt) as he moves from Hawaii to Hong Kong where he met documentary filmmaker Laura Poitras (director of the Oscar-winning Citizenfour) and journalist Glenn Greenwald to hand over top-secret NSA documents, all before seeking asylum in Russia. Scott Eastwood, Rhys Ifans, Timothy Olyphant and more star in the film. Open Road was originally planning to release the film last December, but delayed it until this year. Snowden now opens on September 16th, 2016 this fall. When was the last good Oliver Stone movie ? Absolutely. If you ask me, I always go with the director first before anything else when it comes to pick a movie. Because a good director will always pick a good DP, a good screenwriter and a good cast. It isn't the case the other way around. There are a lot of parallels between his story and Bo Bergdahl. Oh well. At least it's not another GD Steve Jobs movie. JGL looks like my uncle in this movie. Why? because when they saw that Deadpool exploded the box office, they came with the conclusion that the future of cinema will be from now on R-Rating. Even for kids movies... That tells a lot on their smartness. ;D Hollywood is the forge of dumbness, save very few people. And it works. Look how much money a piece of dung like Transformers is doing, when little gems are struggling to find their audiences. For someone who doesn't look like Snowden, I gotta say, JGL has got the voice down. I'll bite - why you don't like Snowden? I'll chew - why you don't like Snowden? Huh? I think you misread what I said.